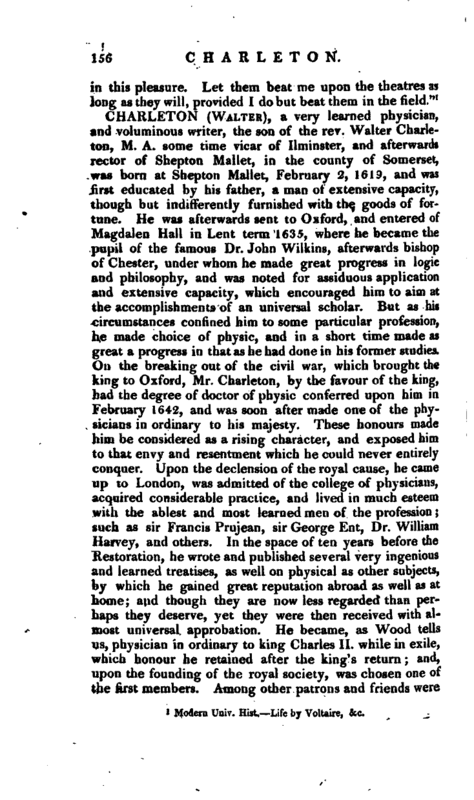 This account obtained a place in the last edition of this Dictionary, and we have been unwilling to displace an article that contains more personal characteristics and anecdotes, than the lives of crowned heads in general, which belong to history, and seldom can be usefully separated from it. was born June 27, 1682 and set off in the style and with the spirit of Alexander the Great. His preceptor asking him, what he thought of that hero? “I think,” says Charles, “that I should choose to be like him.” Ay, but, says the tutor, he only lived 32 years: “Oh, answered the prince, that is long enough, when a man has conquered kingdoms.” Impatient to reign, he caused himself to be declared of age at 15 and at his coronation, he snatched the crown from the archbishop of Upsal, and put it upon his head himself, with an air of grandeur which struck the people. | Frederic IV. king of Denmark, Augustus king of Poland, and Peter tzar of Muscovy, taking advantage of his minority, entered into a confederacy against this youth. Charles, aware of it, though scarce 18, attacked them one after another. He hastened first to Denmark, besieged Copenhagen, forced the Danes into their entrenchments, and caused a declaration to be made to king Frederic, that, “if he did not justice to the duke of Holstein, his brotherin-law, against whom he had committed hostilities, he must prepare to see Copenhagen destroyed, and his kingdom laid waste by fire and sword.” These menaces brought on the treaty of Frawendal; in which, without any advantages to himself, but quite content with humbling his enemy, he demanded and obtained all he wished for his ally. This war being finished in less than six weeks, in the course of the year 1700, he marched against the Russians, who were then besieging Narva with 100,000 men. He attacked them with 8000, and forced them into their entrenchments. Thirty thousand were slain or drowned, 20,000 asked for quarter, and the rest were taken or dispersed. Charles permitted half the Russian soldiers to return without arms, and half to repass the river with their arms. He detained none but the commanders in chief, to whom, however, he returned their arms and their money. 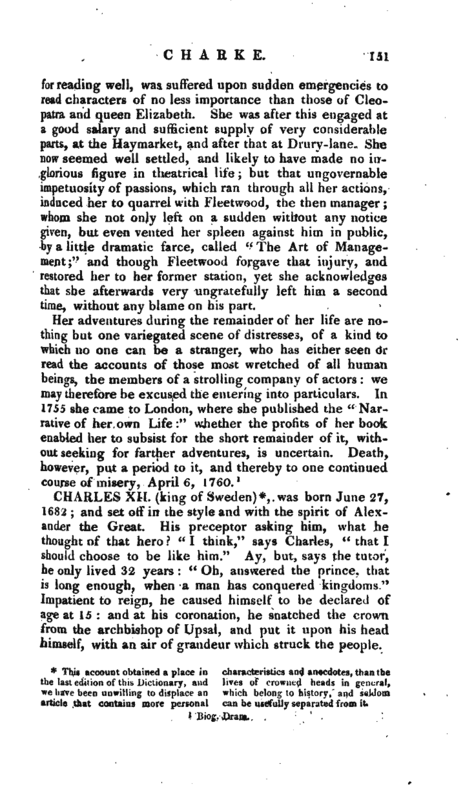 Among these there was an Asiatic prince, born at the foot of mount Caucasus, who was now to live captive amidst the ice of Sweden; “which,” says Charles, “is just the same as if I were some time to be a prisoner among the Crim-Tartars:” words, which the capriciousness of fortune caused afterwards to be recollected, when this Swedish hero was forced to seek an asylum in Turkey. 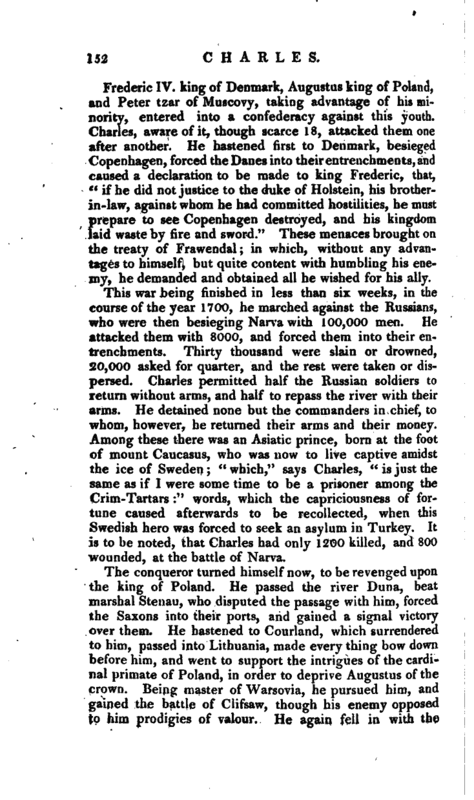 It is to be noted, that Charles had only 1200 killed, and 800 wounded, at the battle of Narva. The conqueror turned himself now, to be revenged upon the king of Poland. He passed the river Duna, beat marshal Stenau, who disputed the passage with him, forced the Saxons into their ports, and gained a signal victory over them. He hastened to Courland, which surrendered to him, passed into Lithuania, made every thing bow down before him, and went to support the intrigues of the cardinal primate of Poland, in order to deprive Augustus of the crown. Being master of Warsovia, he pursued him, and gained the battle of Clifsaw, though his enemy opposed tb him prodigies of valour. He again fell in with the | Saxon army commanded by Stenau, besieged Thorn, and caused Stanislaus to be elected king of Poland. The terror of his arms carried all before them: the Russians were easily dispersed; Augustus, reduced to the last extremities, sued for peace; and Charles, dictating the conditions of it, obliged him to renounce his kingdom, and acknowledge Stanislaus. 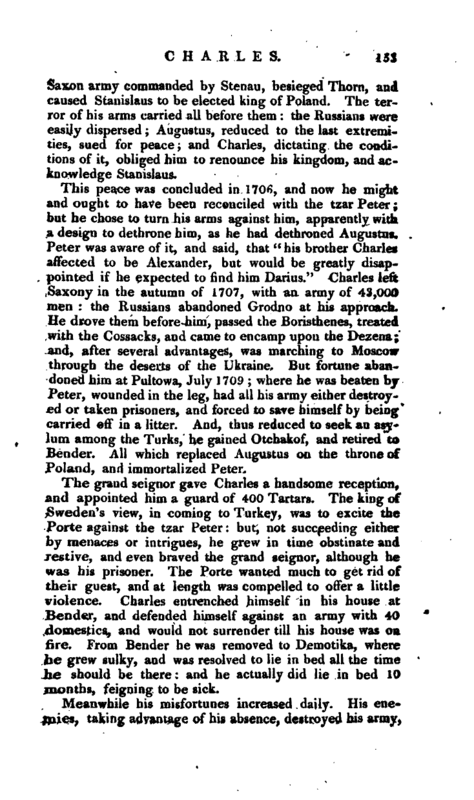 This peace was concluded in 1706, and now he might and ought to have been reconciled with the tzar Peter; but he chose to turn his arms against him, apparently with a design to dethrone him, as he had dethroned Augustus* Peter was aware of it, and said, that “his brother Charles affected to be Alexander, but would be greatly disappointed if he expected to find him Darius.” Charles Jeft Saxony in the autumn of 1707, with an army of 43,000 men: the Russians abandoned Grodno at his approach He drove them before him, passed the Boristhenes, treated with the Cossacks, and came to encamp upon the Dezena; and, after several advantages, was marching to Moscow through the deserts of the Ukraine. But fortune abandoned him at Pultowa, July 1709; where he was beaten by Peter, wounded in the leg, had all his army either destroyed or taken prisoners, and forced to save himself by being carried off in a litter. And, thus reduced to seek an asylum among the Turks, he gained Otchakof, and retired to Bender. All which replaced Augustus on the throne of Poland, and immortalized Peter. The grand seignor gave Charles a handsome reception, and appointed him a guard of 400 Tartars. The king of Sweden’s view, in coming to Turkey, was to excite the Porte against the tzar Peter: but, not succeeding either by menaces or intrigues, he grew in time obstinate and restive, and even braved the grand seignor, although he was his prisoner. The Porte wanted much to get rid of their guest, and at length was compelled to offer a little violence. 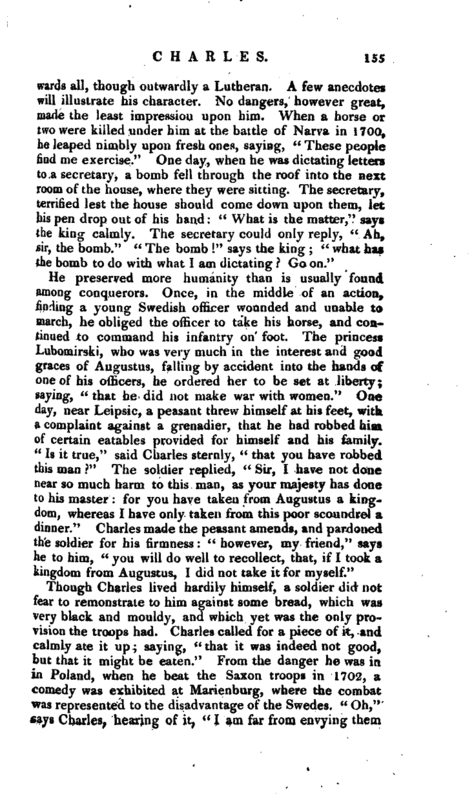 Charles entrenched himself in his house at Bender, and defended himself against an army with 40 domestics, and would not surrender till his house was on fire. From Bender he was removed to Demotika, where he grew sulky, and was resolved to lie in bed all the time he should be there: and he actually did lie in bed 10 months, feigning to be sick. Meanwhile his misfortunes increased daily. His enemies, taking advantage of his absence, destroyed his army, | and took from him not only his own conquests, but those of his predecessors. At length he left Demotika; travelled post, with two companions only, through Franconia and Mecklenbourg; and arrived on the llth day at Stralsund, Nov. 22, 1714. Beset in this town, he saved himself in Sweden, now reduced to a most deplorable condition. But his misfortunesTTad not cooled his passion for warring: he attacked Norway with an army of 20,000 men: he formed the siege of Frederickshall in Dec. 17 Is, where, as he was visiting the works of his engineers by star-light, he was struck upon the head with a ball, and killed upon the spot. His death happened on December 11. Thus perished Charles and all his projects: for he was meditating designs which would have changed the face of Europe. The tzar was uniting with him to re-establish Stanislaus, and dethrone Augustus. He was about to furnish ships to drive the house of Hanover from the throne of England, and replace the pretender in it; and land-forces at the same time to attack George I. in his states of Hanover, and especially in Bremen and Verden, which he had taken from Charles. 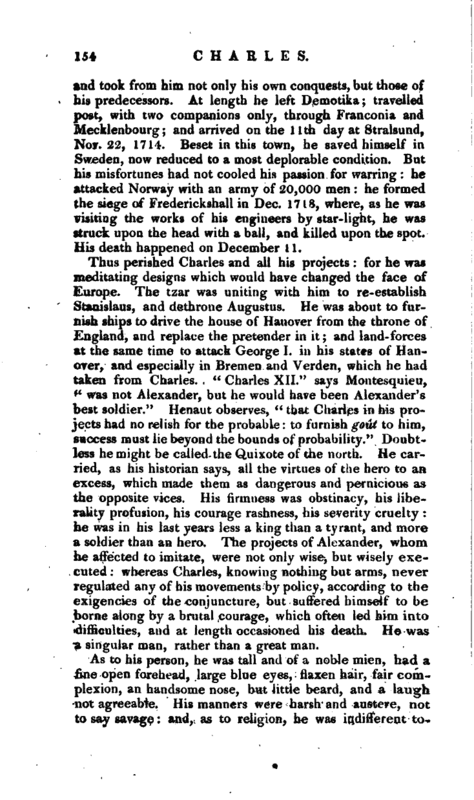 “Charles XII.” says Montesquieu, ic was not Alexander, but he would have been Alexander’s best soldier.“Heriaut observes,” that Charles in his projects had no relish for the probable: to furnish gout to him, success must lie beyond the bounds of probability." Doubtless he might be called the Quixote of the north. He carried, as his historian says, all the virtues of the hero to an excess, which made them as dangerous and pernicious as the opposite vices. His firmness was obstinacy, his liberality profusion, his courage rashness, his severity cruelty: he was in his last years less a king than a tyrant, and more a soldier than an hero. The projects of Alexander, whom he affected to imitate, were not only wise, but wisely executed; whereas Charles, knowing nothing but arms, never regulated any of his movements by policy, according to the exigencies of the conjuncture, but suffered himself to be borne along by a brutal courage, which often led him into difficulties, and at length occasioned his death. He was a singular man, rather than a great man. 1 Modern Univ. Hist. Life by Voltaire, &c.